MILBERT - Commencement of the Falls of Canada Creek . . N°31. Pl. 3. MILBERT, J. - Commencement of the Falls of Canada Creek . . N°31. Pl. 3. Commencement of the Falls of Canada Creek . . N°31. Pl. 3. - MILBERT, J. Title : Commencement of the Falls of Canada Creek . . N°31. Pl. 3.. Size : 9.3 x 11.8 inches. / 23.5 x 30.0 cm. 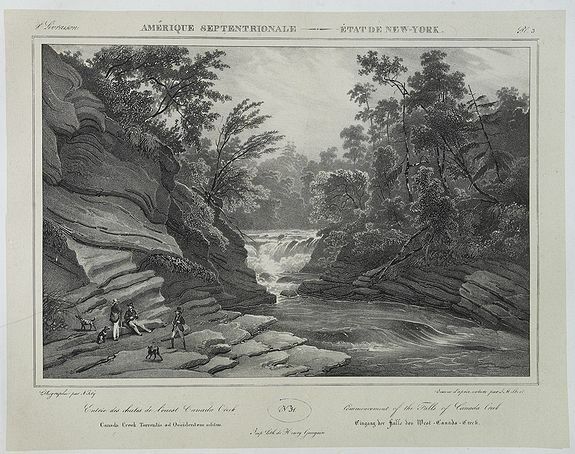 Description :A view of the begginning of the Falls of Canada Creek. From Itineraire pittoresque du fleuve Hudson et des parties laterales de l'Amerique du Nord. After Jacques Milbert. Printed by Henry Gaugain. Milbert arrived in the United States in 1815, with the backing of the Museum of Natural History in Paris, with instructions to explore record and collect as much information about the topography, social history, and flora and fauna of the north east of the country as possible. The task took him seven years, and in addition to the 8,000 natural history specimens he sent back to France, he made a series of highly significant sketches of the areas through which he travelled.